For decades Australian physicists have lusted after a gravitational wave detector, but despite their lobbying, the Southern Hemisphere still has no such instrument. 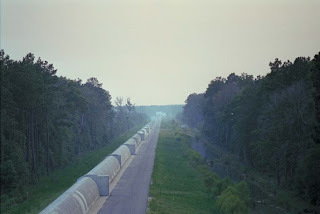 According to Science Magazine's News of the Week, American's at our own Laser Interferometer Gravitational-wave Observatory (LIGO) have concocted a scheme that could change that. The U.S. currently has two detectors, the Livingston Observatory in Louisiana and the Hanford Observatory in Washington State. Because gravitational waves - quivers in the curvature of space time - are expected to travel at the speed of light, when one instrument makes a detection the other should follow in about 10 milliseconds. That short time lapse will let the physicists determine the direction the ripple came from to within a few degrees of the sky (for reference, amateur astronomers typically use the rule that your fist held out at arm's length is ten degrees of sky). Gravitational waves are expected to originate in the most dramatic of cosmic events, like when two neutron stars collide and while they've been indirectly shown to exist, no one has ever observed one. So a fundamental part of detecting such a wave will be having a firm grasp on where it came from. 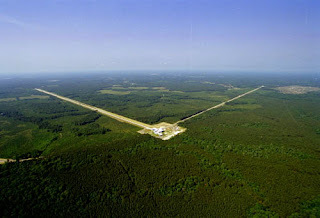 American physicists already coordinate with the Virgo Interferometer in Italy and they claim that should help them determine the direction to within a couple degrees in the sky, but adding a fourth in the Southern Hemisphere has long held appeal to physicists because it could potentially cut that down to one degree (or borrowing again from amateur astronomers, about the size of a pinky finger at arm's length). Each of these instruments is a gigantic L-shape, composed of two 4-kilometer long vacuum chambers for legs. Inside of each vacuum chamber, a laser bounces light back and forth off a mirror in hopes that a gravitational wave will come along and disrupt it by the tiniest amount. A change as small as one-thousandth the width of a proton will set off the detectors. So, to make sure the detection is accurate, a third detector is constantly running inside the Hanford facility to verify the find. LIGO's detectors are in the midst of a $200-million upgrade that will make them 10-times more sensitive - including the cross-checking instruments at Hanford - what the Americans realized is that there's no reason the back-up facility has to be in the same building, or even the same hemisphere. So by simply telling the National Science Foundation to deliver their parts to Australia instead of Washington, they can make everyone happy and increase the world's ability to detect gravitational waves. The catch is that NSF of course isn't going to buy Australians the facilities to go along with the instruments, so if the Aussies are interested they'll have to cover the $170-million price tag to house them. With Australians having a massive deficit, it's unclear whether or not the newly elected conservative government will approve the funds; especially after promising to cut spending in that country. That should be Science magazine, not Science News! Right you are! I made a correction to the post. Instead of the Australians acquiring a gravitational wave detector that has never detected anything (and never will), why not try a radically new design. A ‘Time Variance’ gravitational wave detector is designed to measure fluctuations in the rate of flow of time. This can be built far more cheaply, since it utilizes fiber optics instead of long evacuated pipes. How come when multiple American's get together they become possessive, but when two Australians get together they become plural? Are you implying that "American's" are greedy? I'd say it's just the opposite: the "Americans" are being generous with their scientific equipment! Sorry. I can't help myself. I have apostrophe issues. One missed apostrophe and now I need to hire a tutor in India? :) You guys are a rough crowd.